Sometimes you have to step back and admire a boat for its sheer beauty. 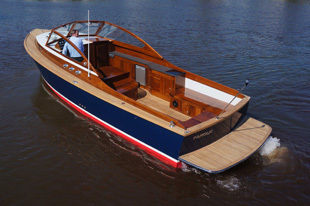 The Cockwells 27 Launch is one of those boats, as graceful and charming as it is exquisitely finished and detailed. 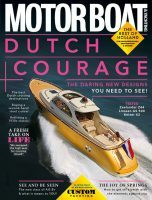 We have a feature of Cockwells boats – including the 27 – coming up in the August issue, so look out for it. The 27 Launch is off to a fine start in life, being based on the fabulous Duchy 27. It is a bespoke build for a Norwegian client of Cockwells who wanted a boat to run him from the mainland to his island holiday home. With a single 115hp Nanni powering the proven Andrew Wolstenholme hull to a top speed of 18 knots it looks to be the perfect boat for the job. Of course in this guise the deck design is focussed on providing as much seating for passengers as possible to ferry friends and family around but there is a convertible vee-berth in the bow so a couple can overnight occasionally. Although the hull is GRP the solid teak superstructure and handmade interior joinery mean the 27 will age with grace, becoming part of the family rather than just a means of transport.